Stood below the immense canopy that covers the apron of Berlin’s Tempelhof Airport, our guide starts his tour with a passionate defence of the building’s design: “This is not Nazi architecture, this is modern architecture. Hitler never stepped inside — he hated it”. Planned before the advent of National Socialism, the design of this airport was influenced by contemporary fashions, including that of the Bauhaus. Yet while the building may lack the neo-classical features favoured by Hitler, it didn’t escape his influence entirely. Between the two ends of its sweeping arc sit thirteen towers. Tempelhof was intended not only be an airport but a stadium, part of a much larger venue within which a million people could celebrate the air supremacy of the Third Reich, and these towers were built to transport thousands of spectators to the roof where tiered seating would provide views over the airfield. But like other parts of the building, many of these towers were never completed. With the onset of war, energies were turned elsewhere. Inside the terminal’s huge reception hall, we’re told that the building instead began life as a factory, with labourers forced to work 18-hour days building aircraft for the military. Workers were permitted to leave the labour camp outside work hours, but needing to wear badges signifying their ethnicity — Jewish, Polish, Russian, etc. — meant it was often safer to stay put than face being assaulted on the street. Venturing onwards, we find ourselves below the terminal where several additional floors provide access to over 300 underground bunkers. This was a common feature of buildings designed during the inter-war period: civil defence an important consideration given the size of Germany’s military had been restricted. These bunkers would eventually be used by Berliners hiding from the advancing Red Army seeking retribution: “The Wehrmacht exported the horrors of war, but they returned like a boomerang”. It was in a small, unsanitary bunker like the one we were stood that our guide’s grandparents met: “I wouldn’t be here today giving this tour if it wasn’t for a room like this”. In 1951, part of the building was given over to commercial air travel. Like elsewhere in Berlin, dividing walls could be found as passengers were not permitted access to areas occupied by the US Air Force. While civilians were checking-in for flights on the lower levels, above them G.I.s might be playing basketball in part of the building originally intended as a ballroom for Hitler and his entourage. Before returning to the reception hall, we move into a small, unassuming entrance area featuring a low-hung ceiling. Our guide points to a series of thick pillars that line the walls and suggests that they appear out of place given the room’s meagre proportions. Only upon visiting the floor above do these make sense. This entrance was originally a much taller hall, and these pillars reached up to a decorated ceiling 15 meters above (since blackened and damaged during the terminal’s brief Soviet occupation). The floor was added by the Americans in an attempt to denazify the space else “Germans might enter the building and unconsciously raise their hand”. In the derelict room left above, much of the cladding was removed for use elsewhere in the city. Here the truth behind the building’s imposing and substantial appearance is revealed: the thin limestone slabs were used to hide tangled rebar and rubble. The symbolism wasn’t lost on anyone. With its complex and chequered past, this is not a building you feel compelled to love, but it’s one I find deeply captivating. As various periods of history and design fiercely collide with each other, to walk just a few meters is find yourself transported from the roaring twenties to the Cold War and back again. The tour only scratched the surface, our guide admitting to having got lost within the terminal’s labyrinth of over 7000 rooms for almost three hours. Concluding his presentation, he spoke of the city’s resistance to allowing development on the edges of Tempelhofer Feld, especially in those areas where labour camps once stood. 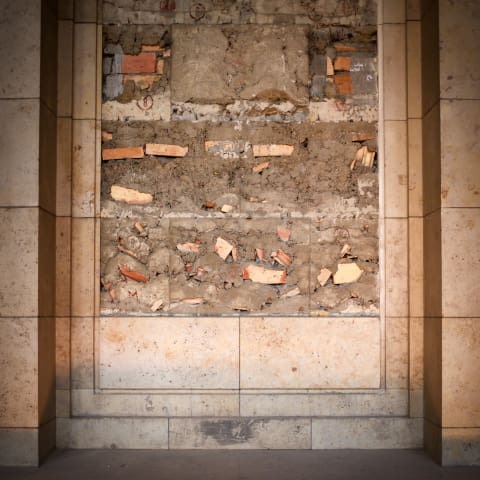 “We need monuments, as well as buildings like Tempelhof, to act as reminders — for us and generations that follow — of what was allowed to happen, so that we can avoid making the same mistakes again”. On German Unity Day, this seemed like an especially pertinent statement. 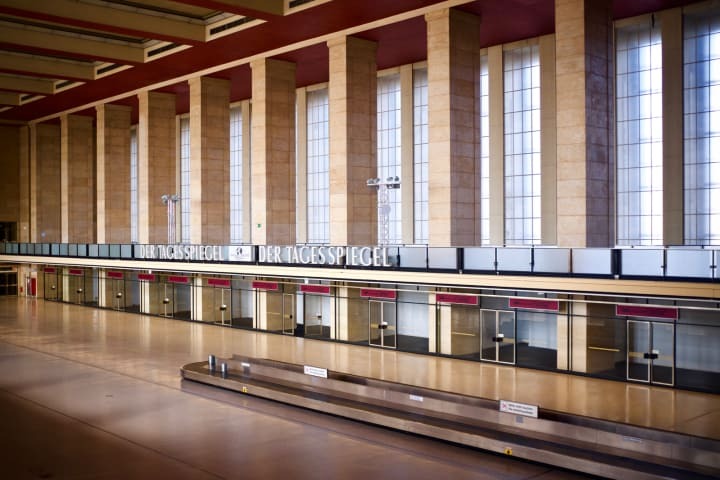 English guided tours of Tempelhof Airport take place every Wednesday, Friday, Saturday and Sunday at 1:30pm. Quotes in this post have been paraphrased and are recounted from memory.